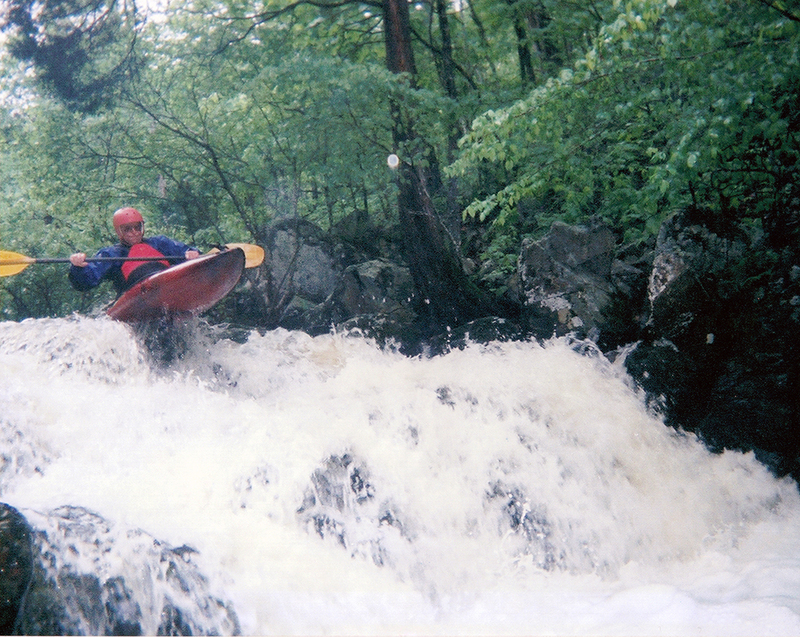 The first descent of this creek was by Chris Amelung, Curtiss Elwood, Diane McHenry and myself. We arrived soon after a heavy bout of rain, almost 2″ as I remember. This creek drops about 200 feet in its last mile. Unfortunately, the only option to do this run is carry up from Big Creek along a well defined trail. We went up about a half mile, and from Mountain Bike reconnaissance, I know that there is a lot more cl-II above where we put in, but the meat (140’/mile) is in this section. We traded leads all the way down so everyone would get a “first rapid” descent under their belt. It was a bit low for us, but even still, the rapids are cl-III-IV variety and a lot of challenging fun. The biggest and juiciest, had heavy wood in it, so it waits to be run! Nevertheless we had pretty much open creek with busy, twisty rapids, and one ledge about 8 feet high. I thought the run was well worth it, and would love to try it again, at higher water maybe, and hopefully get to try the rapid we missed. Once on Big Creek keep a sharp eye on river right, as sometimes gravel piles partially obstruct Mudlick Creek. Once there make your landing and walk up the creek about 50 feet and you’ll intersect the Sam A Baker trail system going right up Mudlick Creek. The takeout is either at the 143 bridge, or further down a mile at the St. Francois River ramp in the park. A highlight will be going through the Big Creek Shut-ins in Sam a Baker Park.